Cancer kills more than 595,000 Americans annually. The Canary Foundation recently presented a gift to Draper to apply its expertise in computer vision techniques to address fundamental limitations of today’s cancer detection tools. Advances in magnetic resonance imaging (MRI) and positron emission tomography (PET) scans have helped clinicians identify cancer faster than ever before. However, these tools often require optimal conditions without which cancer tissue can be missed. “The Canary gift funds a two-year exploration of combining Draper’s expertise in the miniaturization of systems that blend optical sensing and spatial reasoning with vision-based navigation and satellite image enhancement, and applying them to medical imaging,” explained Andrew Berlin, distinguished member of the technical staff at Draper. If successful, Berlin believes advances in computer vision techniques could help break through the noise created by less than optimal imaging conditions — confounding signals. As an independent not-for-profit engineering research and development company, Draper focuses on the design, development and deployment of advanced technological solutions for the world’s most challenging and important problems. It provides engineering solutions directly to government, industry, and academia; work on teams as prime contractor or subcontractor; and participate as a collaborator in consortia. Draper provides unbiased assessments of technology or systems designed or recommended by other organizations — custom designed, as well as commercial-off-the-shelf. 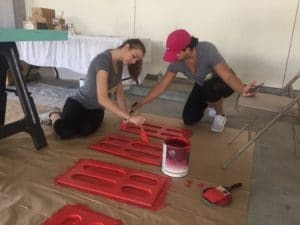 This mo nth, employees from the Canary Foundation, Avaya, and the San Jose Earthquakes all came together to work on painting and decorating a fun and colorful playhouse! 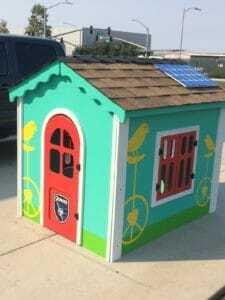 The awesome finished product will be raffled off at upcoming San Jose Earthquakes home games in the Avaya Stadium. Raffle tickets can be purchased from the Canary Center booth before and during the games, which are on 8/24, 9/3, 9/10, 9/24, and 10/1. At the Oct. 1 game, the lucky winner will be announced! All proceeds from the raffle will go towards the Canary Challenge and, in turn, the Canary Foundation and its early cancer detection research and development. Emerson Street in Palo Alto, has decided to take a stand for early cancer detection research and to serve the scientific community devoted to the cause. Canary Foundation staff will be going to the store to represent the Foundation and our purpose. The Canary Foundation will be the beneficiary of this program for the rest of the third quarter, ending Sept. 25. Nitish Amin is a 3-time Canary Challenge participant and is currently gearing up for his fourth Challenge, riding with team Cisco. In this guest blog he reflects on his love of biking and passion for supporting cancer early detection. Growing up in India, I biked everywhere, every day, as a child. I grew up, as we all do, moved to the United States and set biking aside. However, three years ago, I started biking again. The first time I got on my Cannonade (that’s a really great bike, if you don’t know) something just felt right. I have that feeling when I get on the saddle every Sunday morning. I see more when I’m on my bike than when I’m in a car. I usually take the roads and routes that I haven’t explored. It is an amazing hobby that allows me to slow down, even when I’m going 20+ miles per hour. I stop to talk to people. For the next few hours that I’m on my bike, it’s just me, nature, and my fellow biking enthusiasts. I am always amazed at how new many friends I make see when I’m riding. These friends I made, we call ourselves, “CRANK OF DAWN” because we like to ride early. It’s the same during my 8+ years at Cisco, where I get to see how many great people I work with. I am a Software Technology Manager and while we’re all moving fast to innovate and to change the world, when we take a moment to slow down, enjoy what we do, we get to see a little more, take a few unexplored paths, and just talk to each other. We also have time to give back together. I learned about the Canary Foundation through Cisco’s volunteer program. It is the non-profit organization dedicated solely to the funding, discovery and development of tests for early cancer detection. This photo of me is during a 50-mile ride for the Canary Challenge. I like that Cisco encourages us to give back in ways that are personal to us, and in our local communities. My father started one of the first early cancer detection centers back in the 1970s in Gujarat, India. 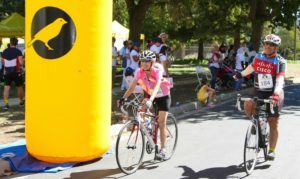 When I ride for Canary, I feel that sense of connection between where I am now, at Cisco, and where I came from, all while contributing to a worthy cause. 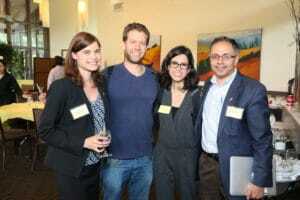 More than 100 members of Stanford University’s scientific community met Tuesday, May 4 at the University Club in Palo Alto. Although their backgrounds were different, they had one major thing in common: cancer early detection. The event – the first ever Canary Summit – allowed researchers to share their work in that field, which ranged from innovative early detection using molecular imaging and cancer biomarkers, to the development of new technologies and medical devices for detecting cancer in its most early stages. All those present were faculty and associates of the Canary Center at Stanford, a world-class facility dedicated to cancer early detection research programs. The Canary Foundation was instrumental in establishing the center and continues to fund it significantly. At the Summit, the Canary Foundation awarded a $50,000 seed grant and committed to awarding $200,000 more in seed grants for attendees of the event to fund their research. 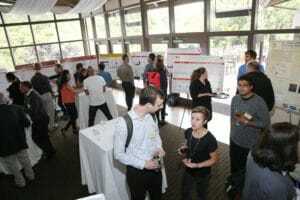 Scientists were encouraged to create posters that illustrated the focus and findings of their early detection research, and attendees voted on the best posters. First Place: Intravascular magnetic enrichment of circulating tumor cells. Jessie Ge (presenting author). Authors: Tianjia J. Ge, Amin Aalipour, Ophir Vermesh and Sanjiv S. Gambhir. Second Place: NFIB is a novel metastasis-specific biomarker of small cell lung cancer. Jessika Baral (presenting author). Authors: Jessika Baral, Dian Yang and Julien Sage. Third Place: Label-free Magnetophoretic Isolation of Circulating Tumor Cells and Clusters from Blood. Jaeyoung Yang (presenting author). Authors: Jaeyoung Yang, N. Gozde Durmus, Hojae Lee, Baris D. Ercal, Ozlem Ercal, Huiping Zhang, Christian Hoerner, Alice C. Fan, Juergen K. Willmann, Ronald W. Davis, Lars Steinmetz and Utkan Demirci. For more photos of the Canary Summit, visit our album on Facebook. 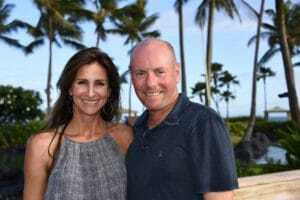 Evan and Cindy Goldberg of Woodside, CA will match your gift to fund early cancer detection research up to $100,000 for Silicon Valley Gives on May 3. If you make a donation to Canary Foundation during this 24-hour online fundraising event, it will be matched by the Goldbergs’ generous donation. To contribute, visit Canary Foundation’s Silicon Valley Gives fundraising page anytime on Tuesday, May 3. There’s no debate that early cancer detection saves lives. No one knows this better than the Goldbergs. The couple has several family members who have had cancer, but thanks in large part to early diagnosis, all of them survived. “They were helped by early detection, and it was a major factor in being cured. Even earlier detection may have made their treatments less invasive,” Cindy says. Longtime supporters of Canary Foundation, the Goldbergs believe that finding cancer earlier, with more accurate testing methods, is the first line of defense, and that reliable earlier detection will make new cancer therapies more effective. Join Evan and Cindy in helping Canary Foundation find cancer early. It’s about time. 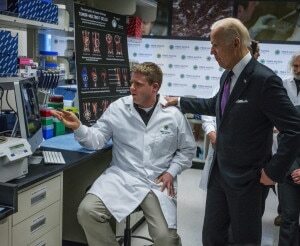 The vice president’s Cancer Moonshot initiative met with researchers at Fred Hutchinson Cancer Center to talk about cures for cancer. Back in January at the president’s State of the Union address, there was one announcement that stuck out for many of us. President Obama announced he was putting Vice President Joe Biden in charge of what is now called the Cancer Moonshot Task Force. It got its name because its mission – to eliminate cancer as we know it – is about as ambitious as putting a man on the moon used to be. A significant early development occurred last month when Biden visited the Fred Hutchinson Cancer Center (the ‘Hutch’) in Seattle, one of the Canary Foundation’s Centers for Excellence, as part of a listening tour. Biden’s visit to the Hutch included a panel discussion with area researchers, care providers, policymakers and patients, as well as Fred Hutch President and Director Dr. Gary Gilliland. The Canary Foundation’s ties to the Hutch extend back to 2001 when Canary Founder Don Listwin discovered the work of epidemiologist Dr. Nicole Urban and a new field called biomarkers. 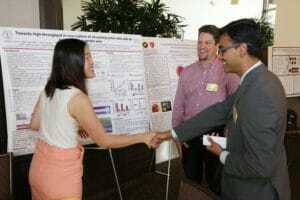 He ended up funding some of her work and then later met Nobel Laureate Dr. Lee Hartwell, director of the center. Don’s investment helped establish the core of a biomarker discovery and analysis program at the HUTCH, and it remains one of Canary’s ‘Centers of Excellence’. Today, the Canary Research Teams at the Hutch collaborate closely with faculty at the Canary Center for Early Cancer Detection at Stanford University to achieve the same goal: saving lives by developing reliable methods for early cancer detection.